Friday Flashback Linky: Fairytale Talk Show & More! Join the new "Friday Flashback" Linky Party where you take a look back at your week and share at least one activity from your classroom that you haven't had time to share about yet! It can be a lesson, strategy, song, read-aloud....anything that was a hit! This week, I'm going to start with our "Fairy Tale Talk Show" that we did today. We're in the midst of our reading strategies unit and we've been learning about questioning while you read. We've learned that you ask questions before you read, during reading, and after reading. We've also learned about asking thin questions and thick questions. As a culmination to our week of questioning, we held a "Fairy Tale Talk Show" today! Yesterday, we read Snow White and the Seven Dwarfs. After reading it, students wrote questions that were not answered in the book. They addressed the questions to the characters and had an opportunity to ask them at our talk show! Of course, we didn't REALLY have the characters come to our classroom....the students took on the roles of the characters! This means that they had to use their reading brains to formulate answers to the THICK questions being asked by their classmates! Another activity we did that I loved was to create a Landform Dinosaur! Have you seen this idea on Pinterest? How precious!! I thought this would be a FANTASTIC way for students to internalize the landforms. They each drew their own as the teacher modeled it step by step. I hope you enjoyed a little "flashback" of our week! What have you been up to this week? Link up below to share your favorite activity(ies) from the week! I'll be back on Sunday! Looking forward to the Carolina Bloggers Meet Up tomorrow and then, of course, to the game to watch my Gamecocks play tomorrow night! So excited about heading to the game tomorrow night! Can't wait to cheer for our Gamecocks at Williams-Brice! I love that doubles song! It's gonna be stuck in my head all weekend! Can't wait to link up to the party tonight! I love the fairy tale talk show! What a great way to get kids thinking about what they read! The Fairy Tale Talk Show is an awesome idea and I love the doubles song! Excited about the link party! Can't wait to meet you in a few hours :) Great idea for a linky. Love all your ideas and this new linky! I'm totally going to use that landform dinosaur when I teach landforms this year! Thanks! 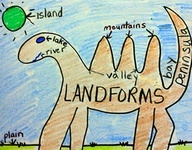 That landform dinosaur made me smile. Really cute and creative. I love your blog! I was at the blog meet up but didn't get a chance to chat with you. Juli and I teach second as well and I am loving that landform dinosaur! Just about to teach that. It was so nice getting to meet you yesterday! I had such a blast! Looking forward to keeping up with you Carolina girls...and the next meetup!